Stewart B. Van Dyne II, has devoted his career beginning in 1968 to building engines and developing engine systems and controls for race teams and aerospace companies. His experience ranges from stock block based race engines made for racing Turbo Offenhausers and Cosworth Formula One engines to hi-tech piston engines for high altitude military aircraft. During Van Dyne's over 47 years in the race engine business - 8 at Traco Engineering, 10 at Drake Engineering, 2 at Leading Systems, and currently with Van Dyne Engineering, he has been directly involved with many championships and engine development projects. Chevrolet engines for Sprint Cars, Silver Crown, Road Racing, Offshore and Circle Boats. Formula Mondial Cosworth BDA engines, Cosworth DFV Fomula One engines. IMSA GTU & GTO Mazda Rotary 12A & 13B, BMW, Porsche, and Merkur engines. Super Vee engines & component development. Drake V-8 Indy engine development. NASCAR AMC Matador engine development and NASCAR Ford Truck engines. FIA Endurance Ferrari 512 M engines. Remote Pilot Vehicle engines, gearbox, and variable pitch prop design and development. Gurney Weslake V-12 Formula One engines and Weslake Ford V-8 engines. Offenhauser and other Vintage Race and Historic engines. Prototype proprietary 6 liter 6 cyl Diesel engine manufacture and test. Systems development for a Hydrogen fueled engine. Manufacture Drake Water Pumps for Chevrolet IRL,Dodge NASCAR,Cadillac Le Mans engines. CNG Fuel System development for a CNG fueled Corvette program. In December 2001,Stewart B. Van Dyne II,and son Stewart B. (TRES) Van Dyne III announced the purchase of Drake Engineering (the Drake-Offenhauser Engine manufacturer) to be merged in to the manufacturing facility of VAN DYNE ENGINEERING. The purchase included all Drawings, Patterns,Tooling, Machinery, Parts Inventory,and Naming Rights to continue the manufacture of the DRAKE, OFFENHAUSER, and Drake-Offenhauser engines and parts. The over 75 year legacy of engine and parts manufacturing has merged well with the Van Dyne Engineering experience in ENGINE SYSTEMS DEVELOPMENT for Aerospace, Industrial, and Race Engine Preparation. This also included the legacy of 26 INDIANAPOLIS 500 WINS for the engines and now we have 33 INDIANAPOLIS 500 WINS with our water pumps. STEWART B. "TRES" VAN DYNE III is a veteran of the race car engine building industry. Tres has honed his skills while working along side his father, STEWART B. VAN DYNE II, at family owned Van Dyne Engineering in Huntington Beach, CA specializing in building race engines for Midget, Sprint Car, Circle boat, and Offshore racing applications as well as vintage Offenhauser engines. Van Dyne Engineering also serves as a consultant in the development of hi-tech piston engines for high altitude unmanned military aircraft. 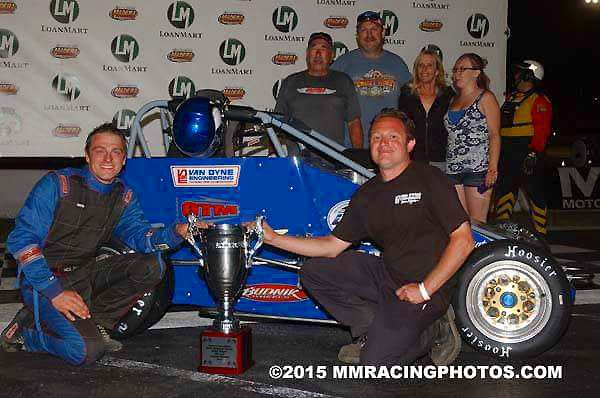 Tres is also an accomplished Crew Chief and has been instrumental in USAC Midget Championships with Wally Pankratz in 2000 and Jerome Rodela in 2005 and 2006. Tres received the Joe Lynch Award for Mechanical Achievement in 2000. 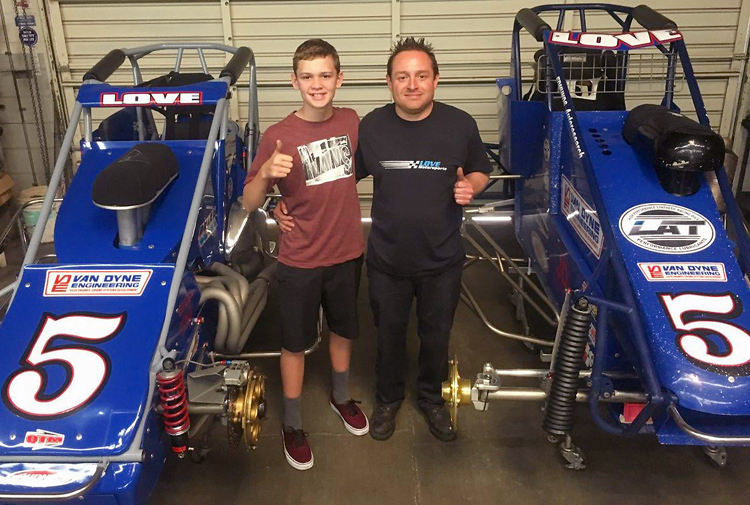 We are pleased to announce that Jesse Love will be driving the Van Dyne Blue #5 midgets in BCRA competition for the 2018 championship. We are excited to get in more practice days and build more cars for the season. 1908 - Harry Miller opens HARRY A. MILLER MFG. CO. to design and manufacture carburetors and fuel pumps. Miller also manufactured engine parts to modify customers' engines for performance and endurance. 1913 - Fred Offenhauser joins Miller as shop manager. 1919 - Leo Goossen joins Miller as designer-draftsman. 1921 - Miller manufactures Miller 183 8 cylinder engines. 1928 - Louis Meyer as a rookie wins INDY 500 with a Miller engine. Dale Drake is crew-chief. 1933 - Fred Offenhauser starts OFFENHAUSER ENGINEERING CO. Continues to manufacture the Miller engine. Louis Meyer wins INDY 500 again with Dale Drake as crew-chief. 1934 - Offenhauser and Goossen design and manufacture the fabulous 4 cylinder 91 cid OFFY Midget engine. This engine was in production and a winner until the early 1970's. 1936 - Louis Meyer with Dale Drake as crew-chief, again win the INDY 500 for the third time. 1937 - Dale Drake opens a shop and manufactures DRAKE 2 cylinder midget engines. 1945 - Dale Drake along with now partner Louis Meyer formed DALE DRAKE MACHINE CORP.
1946 - Louis Meyer and Dale Drake buy out Fred Offenhauser .In the sale Fred dedicated the names 'OFFENHAUSER' and 'OFFY' to them in the bill of sale. 1949 - The engines were still called 'OFFENHAUSER' or 'OFFY' but they changed the corporation to MEYER & DRAKE ENGINEERING CORP.
1965 - Dale, Eve,and John Drake bought out Louis Meyer. Ford Motor Co. had wanted Meyer & Drake to handle sales and service on the Ford 255 DOHC Indy engine, but Dale and John wanted to continue with the Offy and supercharge it. The company name changed to DRAKE ENGINEERING & SALES CORP., Aka DRAKE-OFFY. 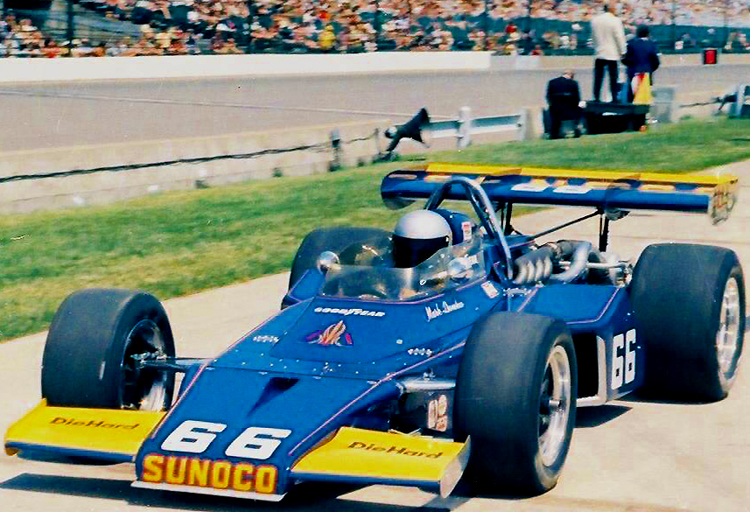 LOUIS MEYER INC. was Louie's new company to service and sell the Ford Indy engine. 1968 - Stewart Van Dyne starts to work TRACO ENGINEERING. 1971 - While at Traco, Stewart would pick up parts at Drake for Davey Crockett, who was in charge of the Offy department at Traco. Stewart became fast friends with Dale, Eve, and John Drake along with Leo Goossen, Walter Sobraske and many others. John Drake starts on DRAKE JET DRIVE for boats. 1972 - Stewart Van Dyne and Eddie Hanson take over the Offy Department at Traco. Both had just turned 24 years old. This is their first time as the engine builders for the Mark Donahue-Penske Racing Indy 500 Team. 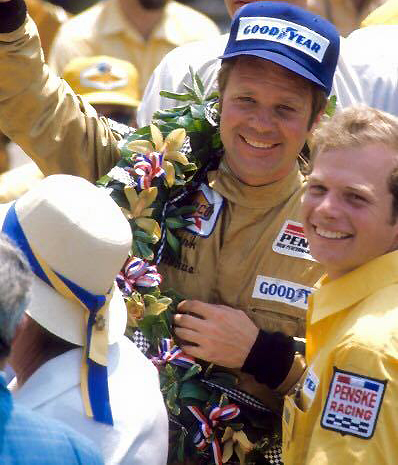 That Mark Donahue-Penske car with the Van Dyne-Hanson built engine wins the 1972 Indy 500. Dale Drake dies. 1973 - Hans Hermann while working for GM OPEL in Germany, meets Stewart at Traco to purchase Chevy V8 parts for a project at OPEL. 1974 - Leo Goossen dies. 1975 - Hans Hermann moves to the USA. Doing consultant work, he stops by Drake to see if he could rent the Dyno to run an engine on. John Drake hires Hans to take over the Engineering Dept. 1976 - John Drake, George Salih, and Hans Hermann ask Stewart Van Dyne to join them at Drake to help with manufacturing and development of a new Indy engine: the DT 160 DRAKE V8. Stewart becomes Manager of Research and Development. 1977 - Drake produces all engine parts to convert RABBIT engines for SUPER VEE Mini Indy competition and prepares Chevys for USAC Silver Crown series. 1979 - V8 over budget. Drake takes in job shop work to stay alive. Drake needs to downsize. A group makes offer to purchase most of machine shop. They want to keep the shop where it is. John and Stewart build a wall and downsize the Drake side to about 8000 feet, keeping some offices, engineering office and dyno room. Stewart becomes Vice President. 1980 - John Drake, Stewart Van Dyne, and Hans Hermann design and manufacture a few 48 cid inline 3 cylinder engines for an Unmanned Air Vehicle prototype project. MAZDA CORP. has Drake preparing rotory engines for IMSA use. Drake starts a Motorsport Division to supply performance engine and chassis parts for water cooled Volkswagen High Performance street and race products. Also preparing Chevys for front running USAC Silver Crown cars. 1983 - John, Stewart, and Hans Design and manufacture a air cooled 31 cid 2 cylinder engine for a prototype Unmanned Air Vehicle. Also design and manufacture a 16 valve head to fit the Rabbit engine for midget use. 1984 - Shelby has Drake design and manufacture a few 16 valve heads for a Dodge 4 cylinder engine. 1985 - McLaren Engines has Drake design and manufacture some prototype 3 valve and 4 valve heads for the Buick V6. 1986 - John, Stewart, and Hans consult on design of a new 4 cylinder engine to be used for an Unmanned Air Vehicle,to be manufactured at Leading Systems Inc.
1987 - Stewart leaves Drake to manage all mechanical assembly,engine development, and gearbox development for a UAV at Leading Systems. John, Hans,and Bob Armas design and manufacture prototype 4 valve heads to fit Chevy V8. 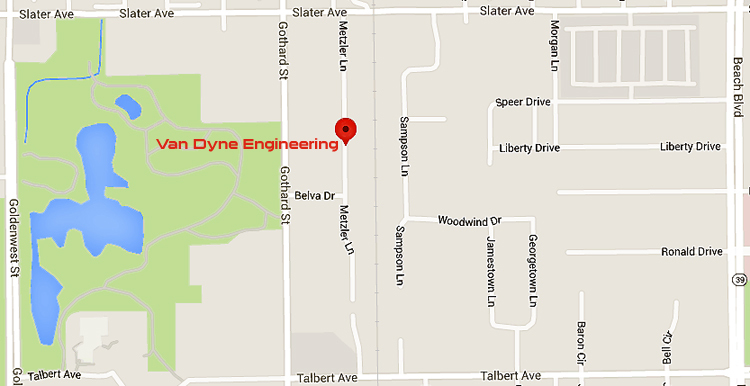 1988 - Stewart opens VAN DYNE ENGINEERING while working at Leading Systems.Hires Bob Armas to run shop during the day. Stewart works at Van Dyne nights and weekends. Offenhauser engines for vintage cars. Chevys for sprint cars, road racing, and boats. Fords for sprint cars and road racing. Lamborghini and Ferrari for street.Tres Van Dyne, at 7 years old, helps dad build a 159 Offenhauser engine. 1989 - Stewart leaves Leading Systems to work at Van Dyne full time. 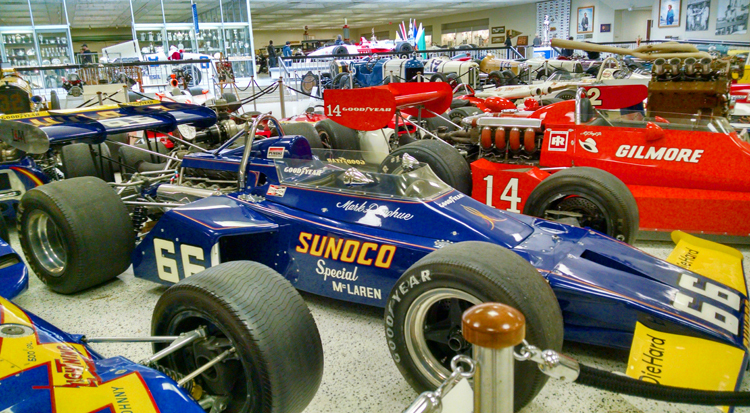 John Drake sends a customer with two 220 Offys to be prepared for vintage Formula One car. 1990 - Van Dyne makes castings and manufactures parts for vintage Gurney/Weslake V12 engines to fit Eagle Formula One cars. 1991 - Van Dyne oversees design and manufacture of a starter and clutch assembly to be used on Midget,Sprint, and Silver Crown Cars. 1992 - John Drake brings the big Offenhauser and Drake V8 patterns and drawings to Van Dyne for safe keeping and combined use. John keeps midget Offenhauser patterns as he is manufacturing a batch of parts to build some 110 Offenhauser engines. Drake designs and manufactures water pumps to be used on small block Chevy and Ford engines. Van Dyne helps John test water pumps on engines. 1993 - Van Dyne designs and manufactures cam drive water pumps for clockwise or counter clockwise rotation. 1994 - Drake continues with 110 Offy engine part production and water pumps. 1996 - General Motors has Drake manufacture water pumps for the new Aurora IRL Indy Engines. 1999 - Dodge has Drake manufacture water pumps for their NASCAR engine programs. 2000 - John Drake and Stewart Van Dyne start talks about Van Dyne Engineering acquiring Drake Engineering and merging it into Van Dynes manufacturing facility. 2001 - Stewart and Tres Van Dyne purchase all of Drake Engineerings Drawings, Patterns, Tooling, Machinery, Parts Inventory, along with Naming Rights of DRAKE, OFFENHAUSER, MEYER & DRAKE, and DRAKE-OFFENHAUSER engines, parts and components to continue manufacturing. 2002 - General Motors has Van Dyne tool up to manufacture a new water pump for the Chevrolet 03 IRL Indy Engines. Van Dyne manufactures water pumps for Dodge, along with engine parts for 255 and 270 Offys. 2004 - Van Dyne consults on a new 6 cylinder opposed 6 liter diesel engine design for a aerospace co. to be used on a UAV project. 2005 - Van Dyne receives diesel engine parts from aerospace co. Had to modify most of the major parts ,because of interference, and manufacture many more. 2006 - While working on the diesel engine project, another UAV company has Van Dyne design a Dry Sump Oil System, for an engine they were using, and do some durability testing on the dyno. Diesel engine will run after New Years. 2007 - Diesel runs on dyno and is a complete success, engine shuts off with a switch. Redesign starts on DT 160 Drake V8 to be used for Bonneville and Hot Rods. Increased capacity to 183 cid or up to 200 cid supercharged, turbocharged, or normally aspirated. New version to be named VAN DYNE-Offenhauser 183 V8. 2008 - Van Dyne manufactures Stellite faced Inconel valves, for engines running on dry fuels, to retard wear on seats and valve faces. 2009 - Continue to manufacture our brands of engine parts:Van Dyne, Drake, Offenhauser, Drake-Offenhauser, and soon to be released the VAN DYNE-Offenhauser 183 V8, a supercharged version. 2010 - The OFFENHAUSER,and Drake-Offenhauser engines and parts have now been continuously manufactured for over 75 years. Our engines have won the INDY 500 26 times and water pumps have won 33 times. We will have to see what the year 2010 brings. From the 405 Freeway take Huntington Beach exits at Warner Avenue, Beach Boulevard or Goldenwest Street, then go to Slater Avenue. Metzler Lane is between Beach Boulevard and Goldenwest Street. 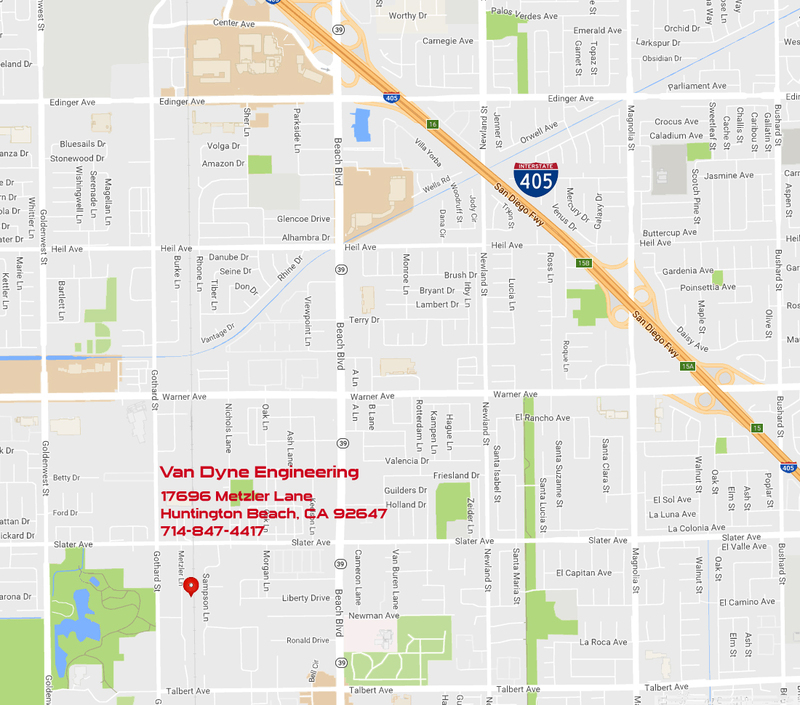 Van Dyne engineering is conveniently located to serve Orange County, Los Angeles, San Diego, Riverside and San Bernardino. ©2016 Van Dyne Engineering. All rights reserved.